Mets ace Matt Harvey was cleared today by his medical team to begin throwing a baseball. Harvey is only four months removed from Tommy John surgery, but this news marks the first step in his goal of returning to the mound. This is great news for both Harvey and the Mets, now we have to be patient with our 24-year-old. Harvey has publicly stated his desire to do his rehab work in NY, most rehabbing players spend their time in Port St. Lucie, but he would like to be closer to his home. This would also allow him to be with the team during home stands, where he could bond with his younger teammates and continue to learn the league from the bench. Everything about that sounds great, but will this ultimately turn into a distraction? In only a short amount of time, Harvey has taken this city by storm. When he emerged late in the 2012 season, he quickly caught the eye of Mets fans and the rest of baseball. But it was his 2013 campaign really put him on the map as a star in the making. He was featured in a Jimmy Fallon show skit, could be seen on celebrity row for countless Rangers games, did a tabloid grabbing interview for GQ Magazine, dated Super-Model Anne V and oh yeah, was the starting pitcher for the All-Star Game at Citi Field. Harvey became one of the hottest athletes in NYC, everyone wanted a piece of him. 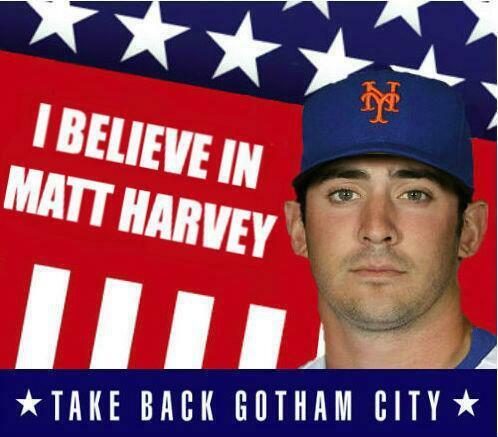 Personally, I don’t care what Harvey does off the field, as long as it doesn’t affect his performance on the mound. I only raise this questions because I know there will be certain media outlets and reporters who will make it their mission to question his work ethic this season. Last season was different, you could find him on the mound every 5th day, no matter what else he did that week. Now, he won’t be throwing off the mound in Citi Field, and many will be ready to jump at the opportunity to question his lifestyle during his rehab process. Harvey does seem to be very mature for his age, just watch one interview and you will be shocked by his poise at such a young age. But every once in a while he surprises me with his actions, for example his GQ interview last season. Whether he was misquoted or thought he was speaking off the record, you have to be smarter than that. These guys are not your friend, they are using you to make a name for themselves. Or more recently, when WFAN’s Joe Benigo expressed his concerns for Harvey’s off the field headlines on air, Harvey became defensive and attacked these remarks via twitter while on vacation in Thailand. The only reason this story gathered any buzz was because of Harvey’s response. If something like that can trigger him while he is on vacation, imagine what it will be like when he is dealing with these questions in New York. No one should question Harvey’s desire and determination to get back on the mound to help the Mets win. He has already thrown around the idea of trying to pitch down the stretch this season. Although this doesn’t sound to be a plausible plan, it’s that kind of attitude that has won over the fans. If I’m the Mets, I would be playing up his rehab throughout the season. Maybe have a crew monitoring his workouts and make it a feature on Mets Weekly. When the team is on road trips, I would throw him in the study and let him give insight on the games. Things like this will help keep him both in the spotlight and mentally focused on his return. As Jerry Seinfeld recently stated, the Mets finally have a “cool guy”. Harvey has all the intangibles to be a star both on and off the field, he just has to remain committed to what got him there in the first place. I don’t foresee Harvey doing anything personally to make his rehab a distraction, I worry more about his reaction to the media that will be out to get him. If he is able to go about his business and keep reporters out of his mind, Harvey should be just fine. But please, stop teasing us with these pitching in 2014 remarks. You’re surgery broke our hearts enough, don’t tease us like that.